Garden Bench, Plastic Garden Bench, Plastic Bench - Danny Plastics Co., Ltd. The hex picnic table is special design for easy DIY installation, which is worth purchasing to enjoy the fun picnicking outdoor and at the same time, enjoy the time for installation furniture by yourself. We provide four colors for your free choice, and the design on round table with chairs around is ideal for family or friends to dine together. 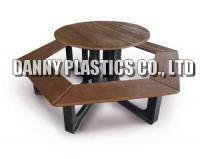 The picnic table is durable for different weather conditions, and it has great ability to resist water, rust and moth. The stainless steel hardware is available as well to strengthen the basic structure of your table. Please do not hesitate and contact us today for more information!